The Northwestern Management Area includes all waters that drain west in Alaska that are north of the Yukon River and south of Point Hope. This includes all the drainages of Norton Sound, the Seward Peninsula, Kotzebue Sound and the Chukchi Sea to Point Hope. The total land area is about 68,000 square miles. Sport fisheries in the area target all species of pacific salmon, Dolly Varden, Sheefish, Arctic grayling, northern pike, lake trout, Arctic char, and to a small degree, burbot. The Seward Peninsula Norton Sound sub area extends from the Seward Peninsula southward to the Yukon River. Streams in eastern Norton Sound include the Golsovia, Unalakleet, Egavik, Shaktoolik, Inglutalik, Ungalik and Koyuk rivers. All but the Koyuk drain the Nulato Hills which separate Norton Sound from the Yukon and Koyukuk River valleys. The Unalakleet River is the largest and most heavily utilized of these. The village of Unalakleet is located at the mouth of this river. The upper reaches of the Unalakleet River have been designated a National Wild and Scenic River and are under the management of the Bureau of Land Management. The river supports anadromous populations of Dolly Varden, chinook, coho, chum and pink salmon and resident populations of Dolly Varden, Arctic grayling and whitefish. Other area streams provide the opportunity for high quality fisheries for the same species, but are not as intensively fished because of the difficult access. Many streams located along the southern half of the Seward Peninsula between Koyuk and Teller (including the Fish, Niukluk, Bonanza, Eldorado, Nome, Snake, Sinuk, Feather, Tisuk, Pilgrim, and Kuzitrin rivers) are accessible via the Nome road system and offer sportfishing opportunity for Arctic grayling, Dolly Varden, salmon and northern pike (Fish, Pilgrim and Kuzitrin). However, many of these streams are closed to chum salmon fishing because of weak runs, so be sure to review the current regulations before fishing. Vehicles may be rented in Nome, and there are a number of local sport fishing guides who can take you fishing. For additional information related to the Nome area, see the Nome Convention and Visitor's Bureau. Small sockeye salmon runs occur in the Pilgrim and Sinuk rivers, and a few remnant late run sockeye are present in most other locations while chinook salmon are present in the Pilgrim and Fish rivers. Large size Arctic grayling, some over 1.4 kg (3 lbs), are present in many Seward Peninsula rivers and many of Alaska's largest Arctic grayling have been taken there. Other remote streams are accessible by aircraft or boat from nearby villages and receive little sport fishing effort. Most of the streams draining the northern half of the Seward Peninsula have never been visited by Division personnel but likely have limited sport fishing potential due to relatively small flow volumes and difficult access. Much of the northwestern Seward Peninsula is part of the Bering Land Bridge National Park Preserve. There are few lakes in the sub area. The largest inland water body is Imuruk Lake in the north-central portion of the Seward Peninsula. It is approximately 32 km2 in area, and drains northward through the Inmachuk River. Salmon spawn at the outlet in the fall and the lake supports whitefish and Dolly Varden. Some small alpine lakes in the Kigluaik Mountains northeast of Nome contain lake resident Arctic char, while others contain Dolly Varden. Glacial Lake in the Sinuk River drainage contains sockeye salmon and round whitefish while Salmon Lake, located about 150 km northeast of Nome in the headwaters of the Pilgrim River, contains sockeye salmon, Arctic grayling, and whitefish. Even though this lake can be reached by road, it receives little sport fishing use because it is closed to salmon fishing. The Kotzebue/Chukchi Sea sub-area includes all waters and drainages of the Selawik, Kobuk, Noatak, Wulik, Kivalina and Kukpuk rivers. The Noatak and Kobuk rivers each drain approximately 12,000 sq mi (31,000 km2) of the western Brooks Range. The Kobuk River is 360 mi (576 km) in length while the Noatak is 400 mi (640 km). The area's third largest drainage is that of the Selawik River, with an approximate drainage area of 4,600 sq mi (11,700 km2). The Noatak River is a National Wild and Scenic River and most of the drainage is included in the Noatak National Park Preserve. The extreme upper headwaters of both the Noatak and Kobuk rivers are included in the Gates of the Arctic National Park. A portion of the lower Kobuk Valley between Kiana and Ambler is included in the Kobuk Valley National Park, and the Salmon River tributary, as well as the upper main stem of the Kobuk River are National Wild and Scenic Rivers as is the Selawik River. Much of the Selawik River valley is part of the Selawik National Preserve. These three large river systems contain abundant fisheries resources. The Noatak River produces a large run of chum salmon that maintain a Kotzebue-based commercial fishery. Many thousands of anadromous Dolly Varden overwinter the lower 300 km of the river and spawn in some of the river's tributary streams. This system is known for the large size of its Dolly Varden, and the current state record 8.9 kg (19.75 lbs.) 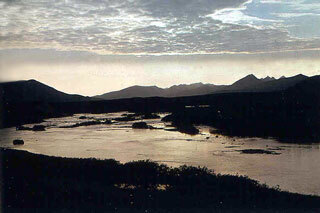 was taken in 1991 from the Noatak River. Whitefish, Arctic grayling, burbot and northern pike are resident in the Noatak River. 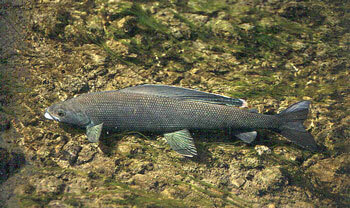 Sheefish use the lower reaches of the river for feeding during the spring of the year, but are not known to spawn there. Both the Selawik and Kobuk rivers support spawning populations of sheefish in their upper reaches. Hotham Inlet, Selawik Lake and the delta systems at the river mouths serve as winter feeding areas for juvenile and adult sheefish. Sheefish in these populations are slower growing, but attain a larger size than those in other areas of Alaska. The Alaska state record sheefish, 24 kg (53 lbs), was taken in 1986 from the upper Kobuk River. Abundant whitefish utilize the rivers, including Selawik Lake and Hotham Inlet and provide a food base for sheefish, northern pike and burbot. Dolly Varden, northern pike, Arctic grayling, burbot, lake trout and Arctic char inhabit various parts of the Kobuk watershed. The Wulik and Kivalina rivers, which empty into the Chukchi Sea near the village of Kivalina, support populations of Arctic grayling and anadromous Dolly Varden. Sport fishing effort in northwest Alaska is relatively light compared to most other areas in the state. Heaviest use occurs on the Noatak, Kobuk, and Wulik rivers. Many visitors to Gates of the Arctic National Park, Kobuk Valley National Park, and the Noatak National Park Preserve participate in float trips on the Kobuk River or Noatak rivers. Guided and unguided anglers and river floaters use these rivers for raft, canoe, and kayak trips. Lake trout and Arctic grayling occur in Matcharak, Feniak, and Desperation lakes and in other lakes in the middle and upper Noatak drainage. Some lakes also contain Arctic char. Most lakes in the area are accessible during summer months only by floatplane. The lower floodplains of the Kobuk and Selawik rivers, especially in the vicinity of the Kobuk River delta, and the lower Noatak River contain hundreds of shallow thaw lakes of various sizes. Fisheries resources in this area have been poorly inventoried, but populations of whitefish, and northern pike are known to be seasonally present. Dolly Varden spawn in several Kobuk River tributary streams. The mountains in the upper Kobuk River drainage contain several relatively large lakes. Lake trout, Arctic grayling, Arctic char, northern pike and several species of whitefish species inhabit Walker, Selby and Nutuvukti lakes.